is the phenomenon, and it has been decided that she is the proper person to have the duty. the poll resulted in a draw Mrs. Lees would have the casting vote; the woman would decide. 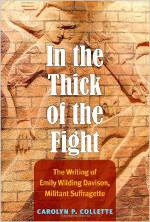 In the Thick of the Fight: the Writing of Emily Wilding Davison, Militant Suffragette, by Carolyn Collette.